Escalation - Get your random questions here! 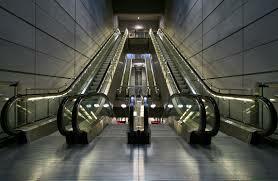 When you take an escalator which do you do more often? If you're standing on an escalator which do you usually do? The reason I've asked this question is because in the past few days I've been on more escalators than any comparable period in my life (airports, metro stations, the convention center, the Georgia Dome). I would have thought that everyone knew escalator etiquette (walkers to the left, standers to the right) but it seems that nobody does. Either people stand two abreast or one person stands on it with one hand on each railing. Life's little annoyances. But what if there are now stairs, there's only an up and down escalator, and you're going from one train to another? I'm scared of escalators, so I always stand waaay off to the side, clinging to the railing. There are very few escalators where I live and no-one ever walks up them, so I don't give it much thought. If I'm somewhere busy, like the London Underground or an airport, and there are obviously a lot of people walking up the escalators, I'll pay more attention to standing to the side. But if there's an option to walk up actual stairs instead, I'll take it. I am afraid of escalators and, if I have to take them, I spend the entire time gripping onto the handrail for dear life and trying not to vomit.